Our school community have been thinking a lot about the close and wider environment in terms of improvements and safety. We have recently announced the introduction of a plastic bottle ban and now we are introducing a Nut-free dining area in school. At a recent assembly Assistant Principal Andrew Livingstone explained that we have created a safe nut-free eating area for those affected by nut allergies. 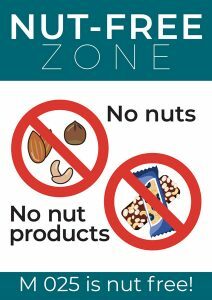 “One of our dining areas, M 025 is now a designated nut-free area and any foodstuffs containing nuts or nut elements must not be taken into this eating area,” he said. “This includes anything with whole or partial nuts such as peanuts, almonds, hazelnuts and so on and any oils or derivatives of nuts. An allergy is the body’s immune system reaction to a substance that’s normally harmless such as nuts, pollen, and certain foods which can include eggs and milk. In the UK, 44% of adults now suffer from at least one allergy. Nut allergies are the most common allergy and have the highest risk of a severe reaction. 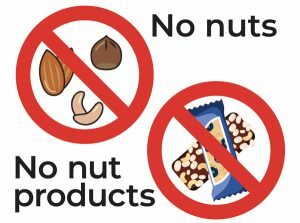 In order to assist with creating a safer environment the school asks all students, staff and visitors to avoid bringing any nuts or nut products into the building at all. In addition to a safer place for students to eat, our catering service provision is nut free as are all our vending machine offers. “We can’t guarantee a totally allergen free environment but we can make every effort to ensure the safest possible environment for fellow students, visitors and staff,” said Mr Livingstone.